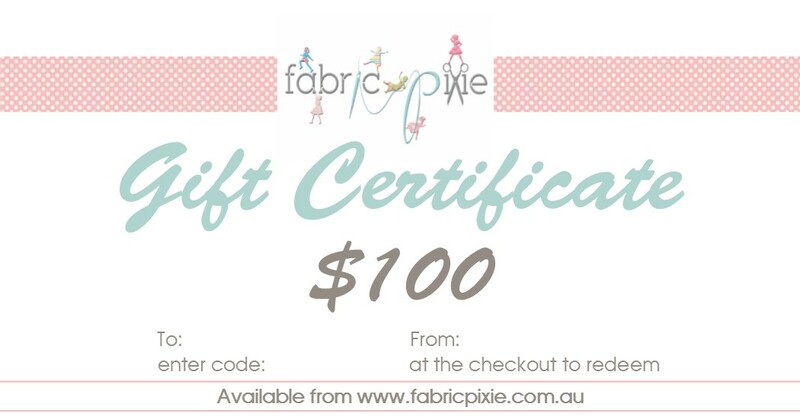 Treat someone you love with the gift of creativity with a Fabric Pixie Gift Certificate! To send a gift certificate instantly to the recipient, enter their email address in the field above. They will receive an email with a special Gift Certificate code that can be redeemed for the purchased value. Or we recommend that you enter your own email address in the above field and the gift certificate will be emailed to you so you can customize your message. An order confirmation email that contains a link to download a Gift Certificate image that you can print or save. We recommend that you print this and write the Gift Certificate code on it to give to the recipient. The Gift Certificate code will arrive in a separate email, give this code to the recipient to enter at the checkout and the value will be deducted from their order. If you wish to email the Gift Certificate, we still suggest that you enter your email address into the above field then first download the Gift Certificate image file and then attach it to a personalised email to your recipient. Be sure to also include the special Gift Certificate code for them to enter at the checkout. When using the gift certificate the value of their order will be deducted from the certificate and any remaining credit will remain and can be used on subsequent purchases until it reaches zero. There are no expiry dates on our Gift Certificates!